So it turns out that, if our Solar System is any indication, water oceans typically exist under a layer of solid ice and rock–not precariously splattered about the exterior of a world. For instance, to the right is the diagram released by NASA last week showing the apparent structure of oceans on Ganymede–the solar system’s largest moon. Hidden beneath a crust of ice and rock, the liquid ocean of Ganymede appears to be deeper than any ocean on Earth. So now we’re starting to think, if Ganymede is any example, that the surface of a world isn’t necessarily where we should be looking for an ocean. Maybe Earth, with its open-sky oceans, is the oddball. It makes sense. Oceans exposed directly to atmosphere risk evaporation. That is probably a part of what happened to the ocean we now are fairly certain existed on Mars. So underground oceans. Not only Ganymede, but at least two other moons: Jupiter’s Europa and Saturn’s Enceladus, also seem to have oceans. We’ve certainly suspected Europa for some time. 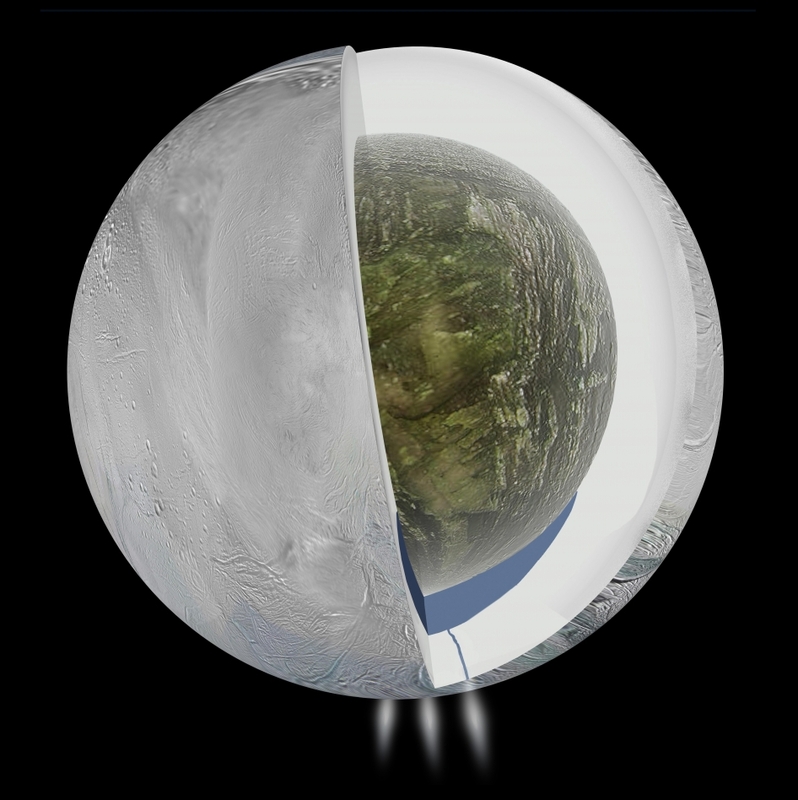 Enceladus is a more recent discovery. Specifically, in April 2014, gravity measurements suggested an ice outer shell and a low density, rocky core with a regional water ocean sandwiched in between at high southern latitudes. Views from Cassini’s imaging science subsystem were used to depict the surface geology of Enceladus (left) and the plume of water jets gushing from fractures near the moon’s south pole. Europa’s inner ocean was perhaps easier to deduce because its surface just looks like a bunch of ice atop a great big ocean. So, of the now five bodies in the solar system known or reasonably suspected to have ocean-sized amounts of water, only two were surface oceans (with one, Mars, having lost its ocean long ago), and three are underground. Moreover, those underground oceans might be a very stable place for life to develop, and if we find it there, it’s probably far more similar to the majority of life out there than is life on Earth. Maybe not. But it sure might make us question our ideas about the “habitable zone” of solar systems. Gallery | This entry was posted in Science and tagged Enceladus (moon), Ganymede (moon), NASA, Ocean, Solar System. Bookmark the permalink.